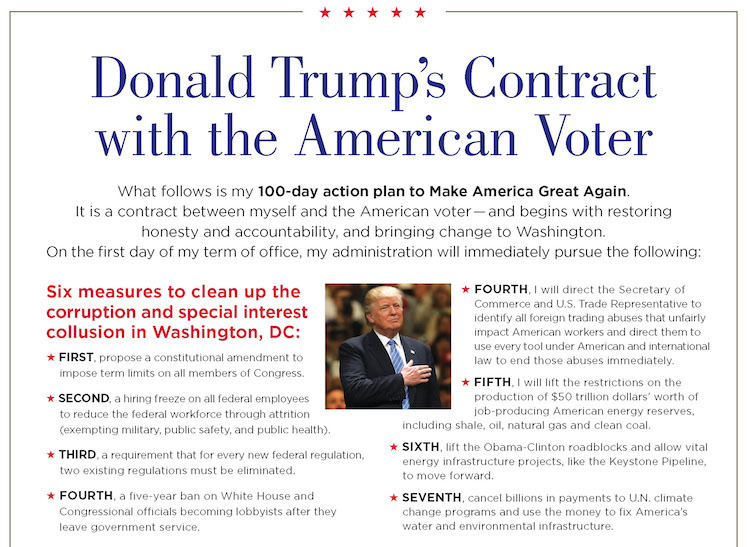 It is a contract between myself and the American voter — and begins with restoring honesty and accountability, and bringing change to Washington. ★ FOURTH, a five-year ban on White House and Congressional officials becoming lobbyists after they leave government service. ★ FIFTH, a lifetime ban on White House officials lobbying on behalf of a foreign government. ★ FOURTH, I will direct the Secretary of Commerce and U.S. Trade Representative to identify all foreign trading abuses that unfairly impact American workers and direct them to use every tool under American and international law to end those abuses immediately. ★ FIRST, cancel every unconstitutional executive action, memorandum and order issued by President Obama. ★ SECOND, begin the process of selecting a replacement for Justice Scalia from one of the 20 judges on my list, who will uphold and defend the U.S. Constitution. ★ FOURTH, begin removing the more than two million criminal illegal immigrants from the country and cancel visas to foreign countries that won’t take them back. An economic plan designed to grow the economy 4% per year and create at least 25 million new jobs through massive tax reduction and simplification, in combination with trade reform, regulatory relief and lifting the restrictions on American energy. The largest tax reductions are for the middle class. A middle-class family with two children will get a 35% tax cut. The current number of brackets will be reduced from seven to three, and tax forms will likewise be greatly simplified. The business rate will be lowered from 35% to 15%, and the trillions of dollars of American corporate money overseas can now be brought back at a 10% rate. Establishes tariffs to discourage companies from laying off their workers in order to relocate in other countries and ship their products back to the U.S. tax-free. Leverages public-private partnerships, and private investments through tax incentives, to spur $1 trillion in infrastructure investment over ten years. It is revenue neutral. Redirects education dollars to give parents the right to send their kid to the public, private, charter, magnet, religious or home school of their choice. Ends Common Core and brings education supervision to local communities. It expands vocational and technical education, and makes two- and four year college more affordable. Fully repeals Obamacare and replaces it with Health Savings Accounts, the ability to purchase health insurance across state lines and lets states manage Medicaid funds. Reforms will also include cutting the red tape at the FDA: there are over 4,000 drugs awaiting approval, and we especially want to speed the approval of life-saving medications. Allows Americans to deduct childcare and eldercare from their taxes, incentivizes employers to provide on-site childcare services and creates tax-free dependent care savings accounts for both young and elderly dependents, with matching contributions for low-income families. Fully-funds the construction of a wall on our southern border with the full understanding that the country of Mexico will be reimbursing the United States for the full cost of such wall; establishes a two-year mandatory minimum federal prison sentence for illegally re-entering the U.S. after a previous deportation, and a five-year mandatory minimum federal prison sentence for illegally re-entering for those with felony convictions, multiple misdemeanor convictions or two or more prior deportations; also reforms visa rules to enhance penalties for overstaying and to ensure open jobs are offered to American workers first. Rebuilds our military by eliminating the defense sequester and expanding military investment; provides veterans with the ability to receive public VA treatment or attend the private doctor of their choice; protects our vital infrastructure from cyber-attack; establishes new screening procedures for immigration to ensure those who are admitted to our country support our people and our values. On November 8th, Americans will be voting for this 100-day plan to restore prosperity to our economy, security to our communities and honesty to our government.